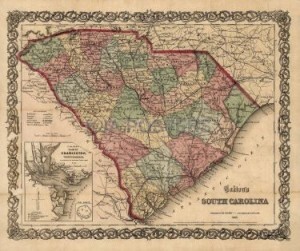 Dual Baptist narratives continue in South Carolina this month, intertwined yet divergent. Many white citizens (including Baptists) of Charleston, South Carolina, a city besieged by nearby Union naval forces since July, have fled inland and northward to Orangeburg. The roster of refugees, mainly women and children, continues to grow as winter looms. An area with some similarities to the South Carolina coast, Orangeburg District (County) is prime agricultural area located in the state’s Piedmont Region and home to a large concentration of cotton plantations. Like the coast, the Orangeburg area is peopled primarily by African slaves. Prior to the war and the Union occupation of the Sea Islands, many of the chattel had worked on plantations along the coast, with some having brought their native African Gullah culture and language with them. While the lives of slaves in the Orangeburg District is bleak and brutal, blacks are aware of, and quietly celebrate, U.S. President Abraham Lincoln‘s Emancipation Proclamation and the steady, if slow, advance of Union troops southward. In Orangeburg District, the fears of white Baptists and the hopes of black Baptists converge and smolder with quiet tension. Today the newly-constructed first meeting house of the (white) First Baptist Church of Orangeburg is dedicated. Perhaps a few Charleston refugees are present for the ceremonies at the red brick church building that had cost $8,000 to construct. Rev. W. B. Carson, the church’s pastor, delivers the sermon. Other major denominations have been worshiping in Orangeburg for many years; the Episcopal congregation was established in 1749, a mere fourteen years after the town’s founding. Baptists, however, did not organize until 1861, and then with only fifteen charter members. While First Baptist Church Orangeburg serves as the center of white Baptist life in the county, an African American Baptist congregation is established this month among the plantations southeast of town. The Mt. Zion Baptist Church, one of the first churches to be founded in what later becomes known as the Cope and Bolentown areas, is a congregation primarily (perhaps entirely) comprised of slaves. The congregation initially owns no facilities nor has much in the way of financial resources. Yet slave church worship offers a degree of free spiritual expression, while members hope for the bodily freedom that would come with a victory of the United States over the Confederacy. Orangeburg District thus provides a microcosm of a new future that is rapidly unfolding in the lives of Baptists of the South. Both churches are later affected by the war: the First Baptist meeting house is appropriated by occupying Union troops in February 1865 as a stable and a storehouse, while the arrival of the Union army brings freedom to slave members of the Mt. Zion congregation. Surviving the war, both congregations exist to the present day.